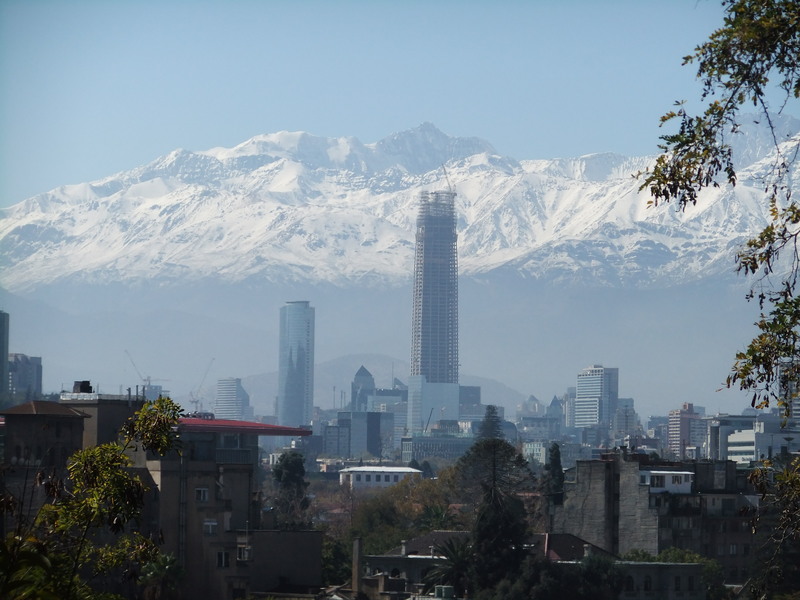 Santiago is not only one of the most modern and industrialized cities we’ve come across in South America, it is also one of the most scenic. It WAS apparently considered the most beautiful place to live in the world… before all the smog settled in. Sadly, the smog is Santiago’s downside. We did managed to catch the city during the end of an extra long weekend, which meant no cars and factories working for a few days, and clear, sunny skies for us to enjoy! But unfortunately this is an uncommon occurrence for the city. Over our three nights in Santiago, we actually had to stay at two different hostels. Apparently the long weekend made for very full hotels and the closed pass between Chile and Argentina left people stranded an extra couple of days. On top of that, some hotels were actually closing for the WINTER at this point. But on our second and third night we stayed at this adorable hostel run by a tiny, old woman we simply referred to as “grandma” from the second we met her. She didn’t speak a word of English, but blabbered on to us in Spanish as of we were her long lost grandchildren coming for a visit. Everyday she wore a tiny pin of a Canadian flag on her shirt, and seemed so excited that we were actually from Canada! She was aaaaaaadorable!! Once again, we were completely unproductive in the city: it was wonderful. 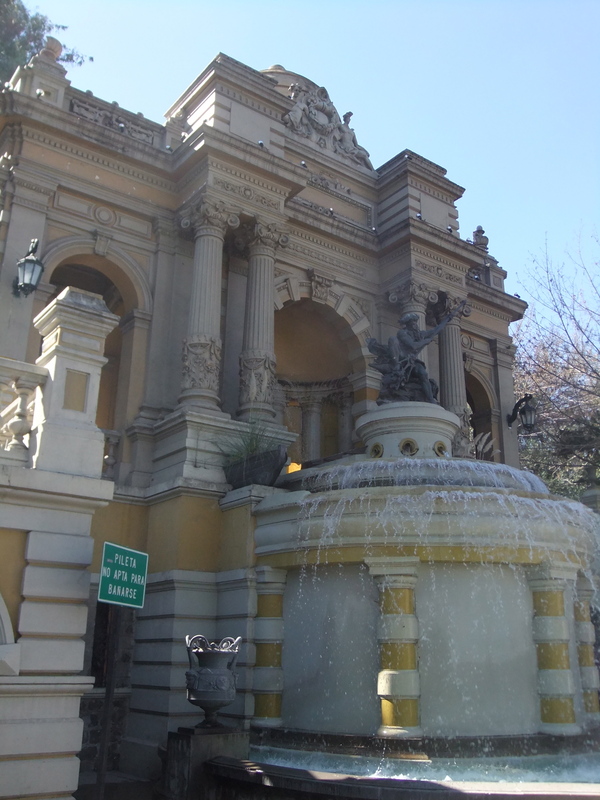 We walked around the downtown core the first day and were surprised at how green and active Santiago really is! 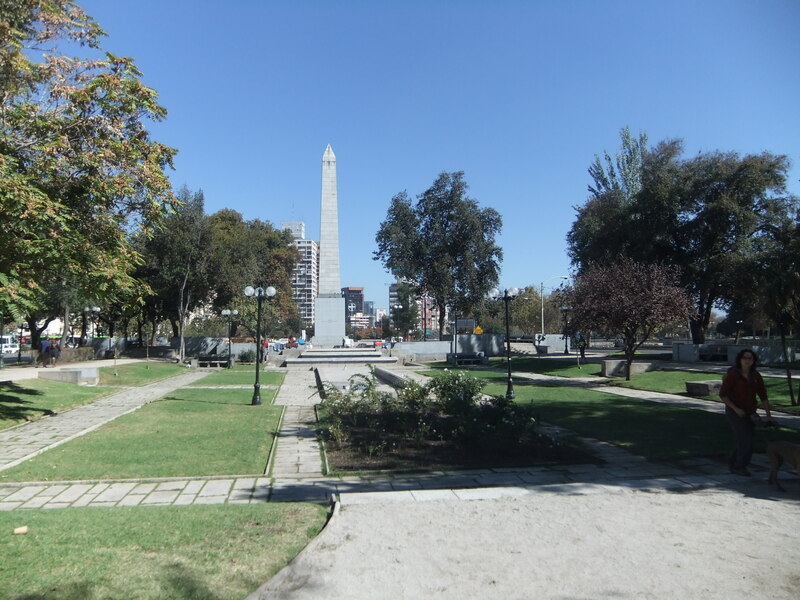 A huge green park runs right through the middle of the city and continues for kilometers! Patrolled by mounted police, the park is full of bikers, runners, rollerbladers, picnickers, families, dogs and everyone else under the sun it seems! It wasn’t crowded ever, but it was definitely well loved. 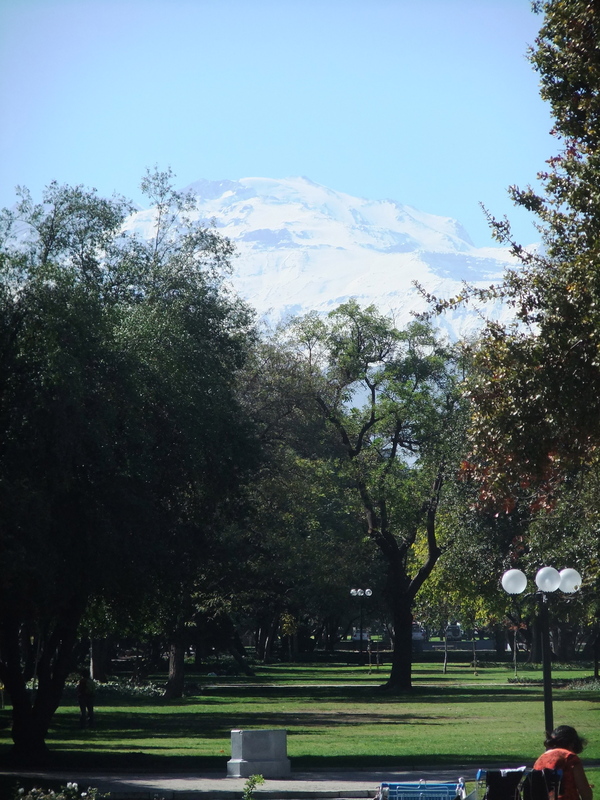 From the park you could see the Andes Mountains looming in the distance. They were gorgeous and covered in snow and reminded me a lot of the North Shore Mountains from home. We did meet a girl who moved to Santiago and she said she was in the city a whole week before she knew the mountains were there. Apparently the smog is usually so bad they are completely invisible… How sad. 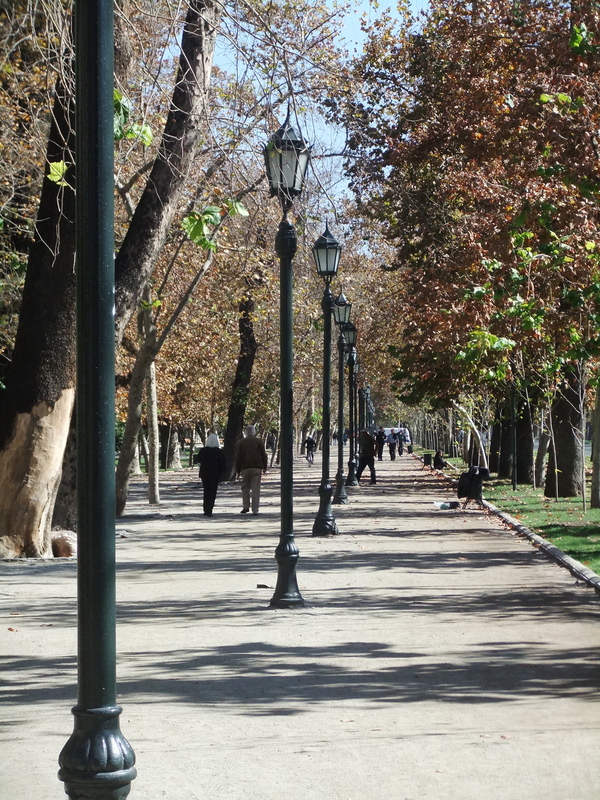 We also heard that you haven’t truly experienced Santiago unless you’ve taken a nap in the big park. So, as stressful as that sounded, that’s what we did, 2 days in a row! We checked out the city sites, smaller parks, cafe’s, a small castle nestled in the city center, then lay down and took a nap! The architecture was beautiful and colonial and there were very few modern looking high-rise buildings (which I was expecting from such a major city). It managed to keep it’s quaintness, even though it houses about 1/3 the population of Chile! After nap time in the park, it was vino time at the hostel. The upstairs balcony had a great setup of comfy couches where we stretched out and continued our ongoing crib tournament. We ordered takeaway pizza the first night and spent hours enjoying the final hours of sunlight from the deck. On our second evening, we discovered the Bella Vista district, which was full of touristy restaurants and cafe’s. It was tucked down a pedestrian-only alley and opened up into three major squares, each filled with three levels of restaurants on all sides. Great food, huge selection and awesome for people watching the night away. Although we tried to avoid it, we were both craving steak and ended up having a wonderful meal at a fancy steakhouse right in the middle of the square. Sometimes it’s hard to believe we’re backpackers. The next morning we were up at the crack of dawn to start our bus ride back to Argentina. 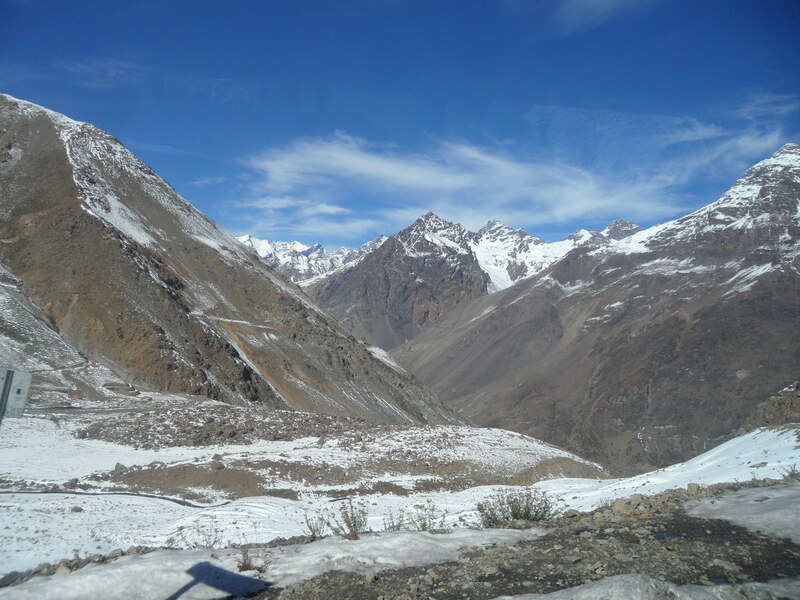 The pass was finally open again, and we booked ourselves a day bus (anything to avoid overnight buses still). The scenery between Santiago and Mendoza is unbelievable. 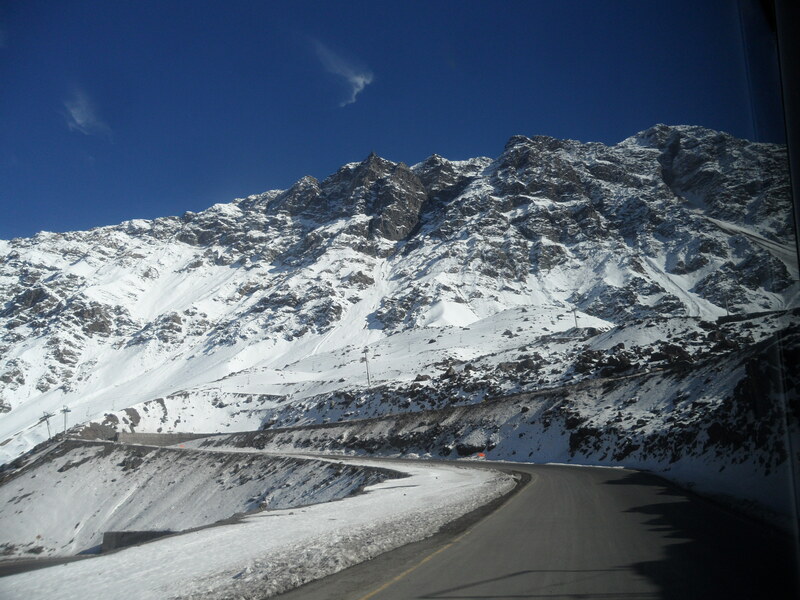 This is the Andes mountain range at its best! We drove through snowy passes and cruised by mountains that were surprisingly similar to the views between Banff and Jasper. Gorgeous, overly dramatic mountain ranges that you could never tire of if you lived there! So glad we decided to travel during the day! 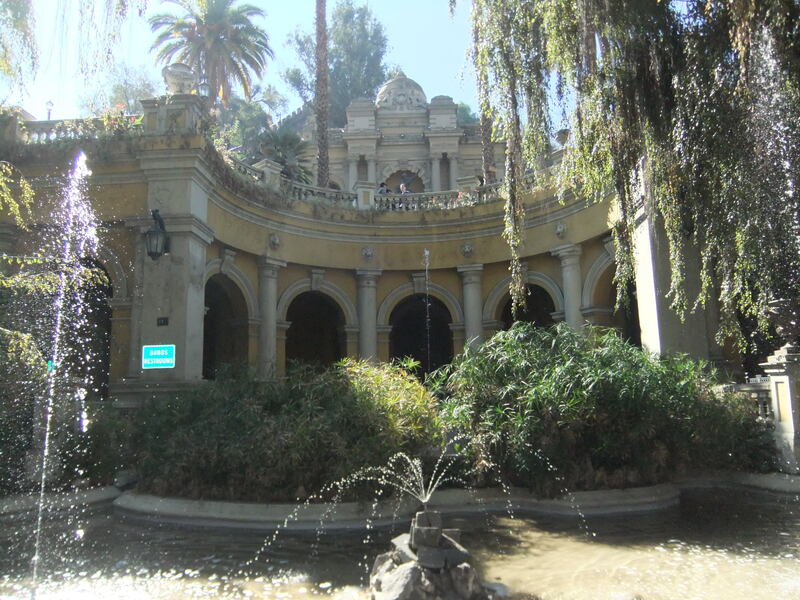 This entry was posted in Chile, South America and tagged Andes, Santiago, Travel by hilarylust. Bookmark the permalink. I like the amazing photos and the description of the city and the journey. Thank you for the road trip with your words. Hi, I’m from Santiago and all of your descriptions are very true, I’m glad that you have a good time. 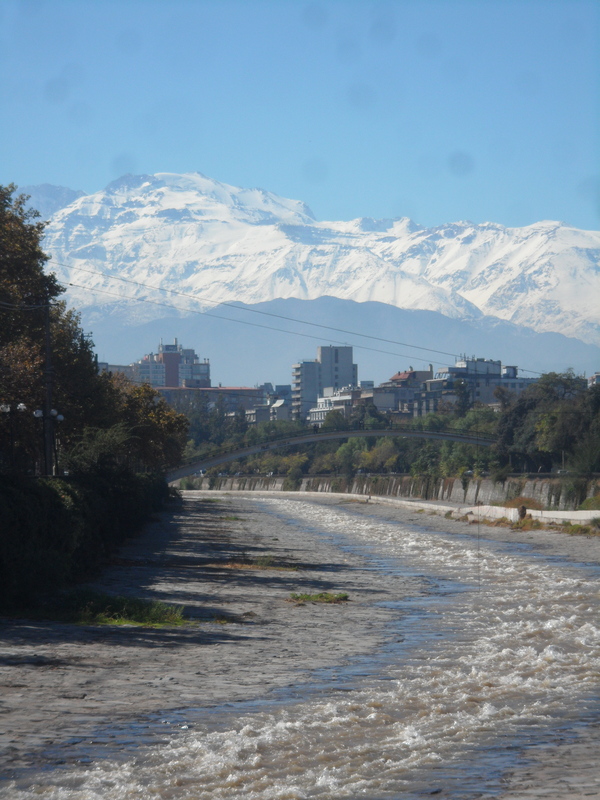 What I mostly love about Santiago is Andes mountains, as you saw we are surrounded by mountains and I wouldn’t feel at home without them. You live in a very beautiful city! I hope I get the chance to visit Santiago again one day.